Thomas Dartigues aka Decktwo has two different kinds of passions. One is the city, which he tries to represent in all its variety and complexity. 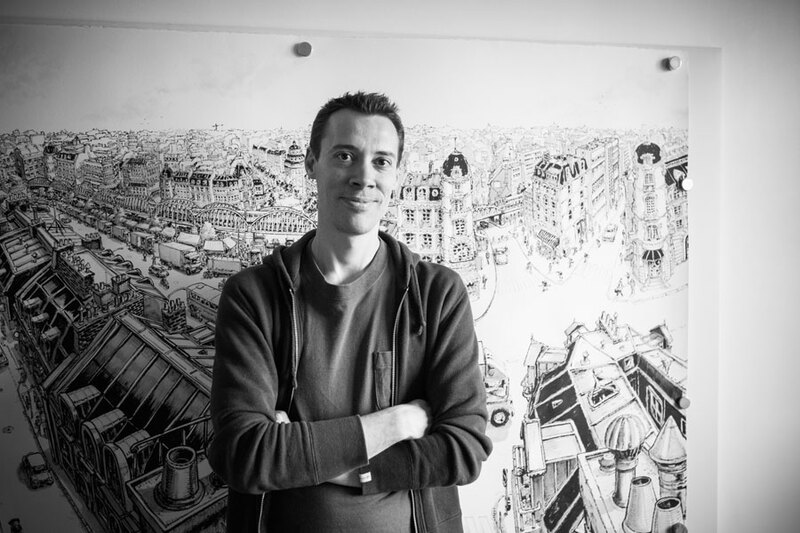 His drawings are so full of detail that they are best seen on a huge scale. Which is how he draws them most of the time. 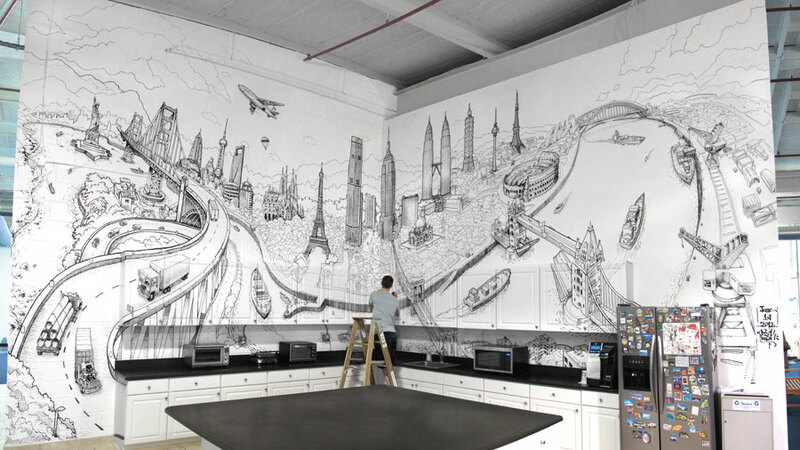 He does cityscapes on entire walls, a process that can take several days or even weeks. By now, he’s well known around the world and his projects take him to New York or Tokyo. 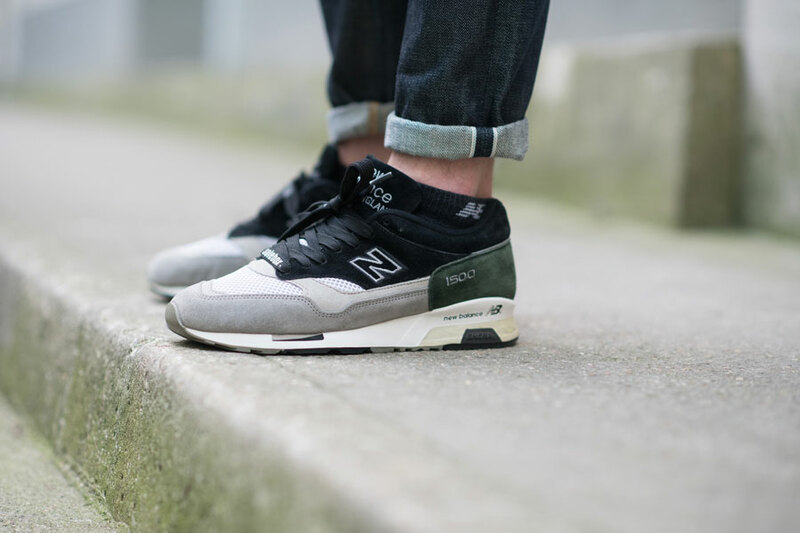 His other passion is New Balance, which he discovered in the 90s, when he figured out his own taste in footwear. The relaxed purity and timelessness that drew him to the Boston brand still excite him. 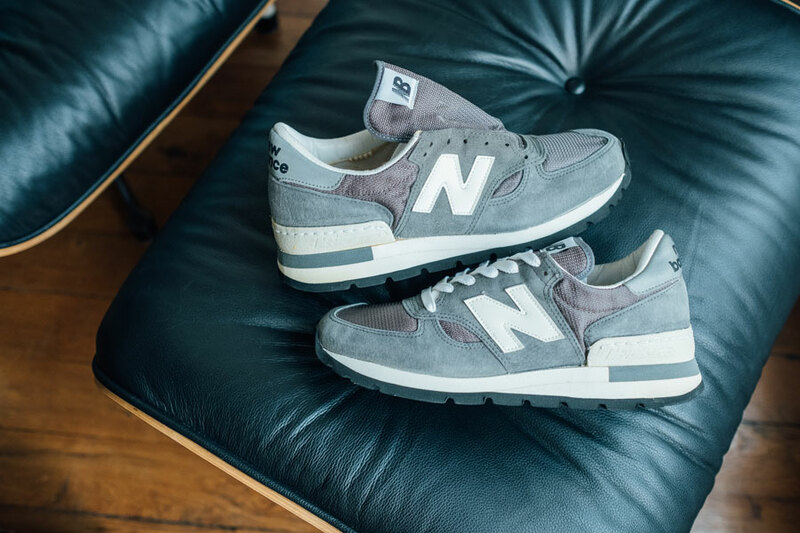 And in just the same way that he draws his cityscapes with pure black ink on white walls, he likes how New Balance uses grey as their most important colorway. 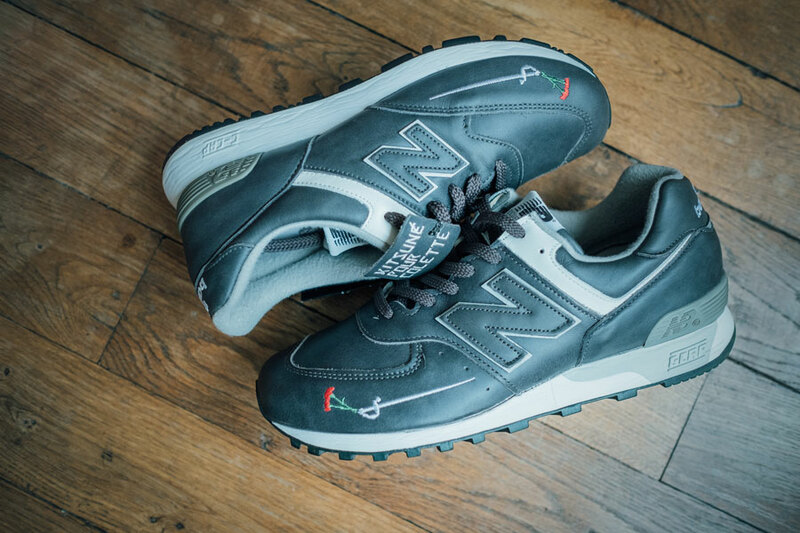 In a very nice way, his two passions came full circle this spring, when New Balance collaborated with him for the relaunch of the 574 on its 30th anniversary. His piece was a tribute to the city of Boston and an homage to the iconic classic – entitled “574 Greyscape”. We wanted to know more about the Parisian artist, which is why we visited him in his own studio to see some of his art and of course his amazing NB collection. Enjoy. Thomas, let’s start with your art. How did you get into art in the first place, and what were your first images and technique? I’ve been drawing since I was a kid, but I started to really focus on it around 11 years old, with a classmate I found extremely talented. I was drawing mostly characters, often inspired by comics I was reading at the time. It’s been like a virus ever since, I was hooked really fast! Later on I went to a fine arts school and practiced other techniques. I worked on animation, motion graphic design, and in parallel I discovered graffiti with friends. You mentioned fine arts school as your formal education. Would you say that part of your approach is still DIY-inspired? I graduated from a fine arts school but I’ve been drawing since I was a kid. School teaches you the basics, but at the end of the day, it’s all in your hands. Only you can complete your projects; you are the master of your craft. I believe every day is an opportunity to learn new stuff and the best way to do it is to experience things by yourself. My mural practice comes after years of drawings. I recently chose to work with pigmented ink for the first time, it was brand new for me; I’m still failing but I learn from it. So don’t be afraid to get your hands dirty! Emulation is kind of essential too. I have the chance to work with Nathalie, my partner, in all those projects, and it’s the best way to confront ideas and move forward in new directions. Real support is key! Your main protagonist and subject is the city, which you render on a huge scale and with so much precision and detail. Why is the city so fascinating to you that you give it this amount of attention? I visualize the city as a living body, with highways like arteries spreading all around, buildings like organs growing from the ground, cars and pedestrians like blood cells moving to every part of this complex organism. It’s quite fascinating to watch our world changing and evolving. There is so much to see. Cities I like to draw are full of history. When I have the chance to travel, I want to see each part of the cities I visit, I just want to feel immersed and stare at them to record all the details my eyes can see. The city is full of energy, a place of tensions and struggles, and I like to find rhythms and patterns when I’m traveling through it. I usually don’t realize I’m adding so many details. When I’m drawing, I just feel these are necessary to create the most genuine portrait of it. Your scale is incredibly big, and your pieces must take long hours. How did you get into drawing on walls and in this size? Do you have a graffiti background, or did you just slowly start drawing on bigger canvases? When I entered fine arts school I was already sketching in notebooks every day, mostly in black and white. My friends were doing graffiti and, as I was very into the hip-hop scene, I started to paint with them in 1997. That’s where my drawing process evolved, from the traditional paper to wall paintings on much bigger scales. I was stoked by this new kind of expression, requiring not only your hand and your arm but your full body in the process of creation. This wall painting method taught me a lot about how to understand space and to work on larger compositions. In 2012, I was commissioned a wall painting in New York. That’s the first time I felt I needed to use my black-and-white drawing skills directly on the wall. I switched from spray cans to acrylic markers that allowed me to be more precise and detailed. I must admit the process took much more time than a classic wall painting! But I had never felt more sure that was what I wanted to do, what I needed to do to represent the city. 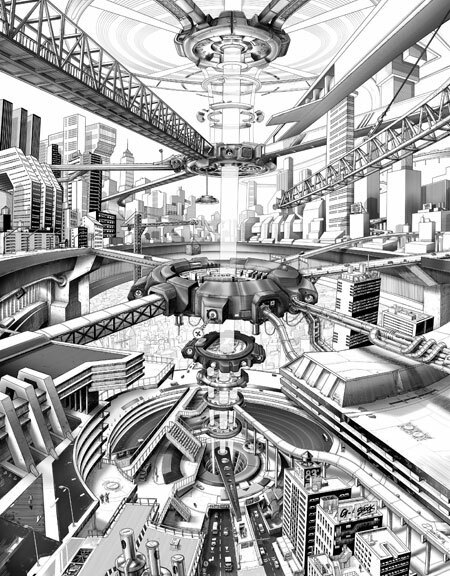 That’s where I started to draw large cityscapes. What are the most interesting cities for you to draw, and why? I’ve been living in Paris for 15 years now. Haussmann architecture, with its refined façades and curved lines, is always a delight to look at while wandering the streets. The typical grey roofs with their distinctive chimneys have a major inf luence on my sketches too. I discovered New York in 2004. It was my first major travel outside of Europe, and that was a shocker! It was a brand-new experience of verticality and a feeling of vertigo while facing those gigantic towers. I felt the energy of the city, and this inspired me to take a new direction in my practice. With Nathalie, my partner in crime, we worked in NYC many times since, and each trip made us discover a new face of the city through people and locations we visited. 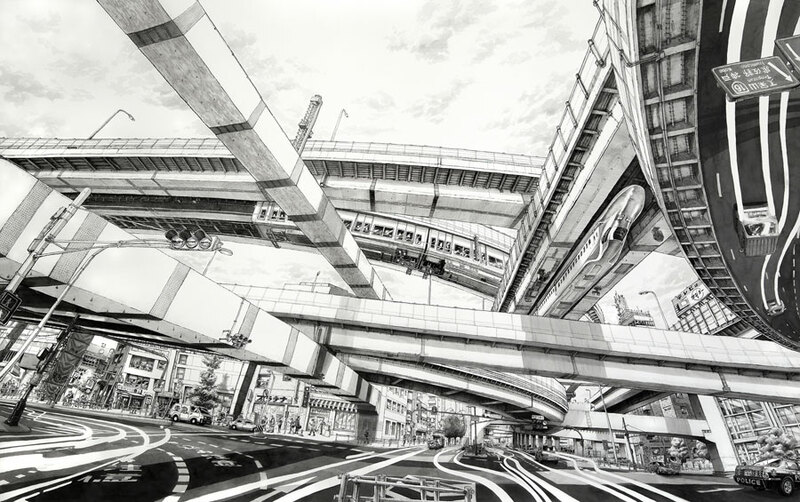 We were invited to Tokyo for a drawing project in 2015 and this trip to Japan was astonishing. A 360 degrees experience! The city is built like a complex, multiple-layers structure, with highways crossing the city, restaurants and shops at different f loors of the buildings, even in the basement sometimes. I enjoyed paying attention to all the details, cars and trains, shopping windows, Japanese signs and neon lights… This trip was a culture shock and I was inspired to draw several pieces when I came back. I can’t wait to go back there! 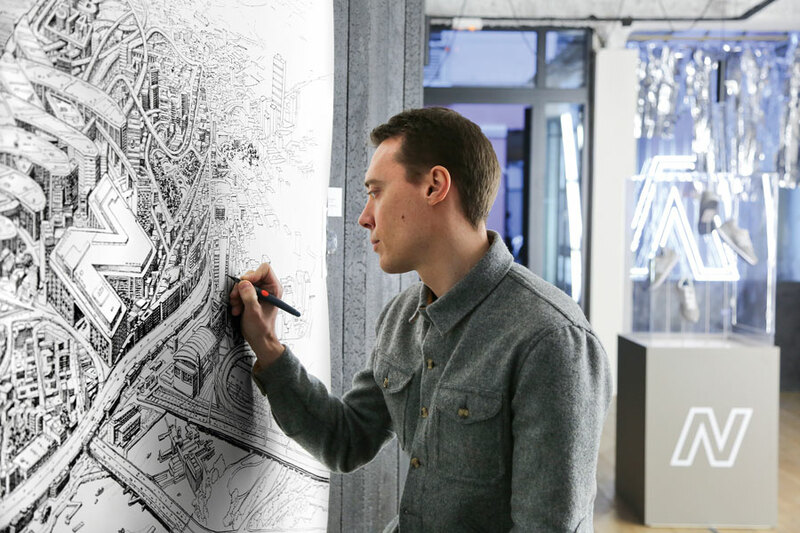 Recently, I worked on a large drawing performance representing the “Grand Paris”. I tried to capture the different architectures and create a new city by mixing contemporary future projects that will emerge, like the Tour Triangle next to the over century-old buildings with all their history. It symbolizes the contrasting social environment that we live in. Can you explain your artistic process? With a new image, where do you start and what are the steps between that first thought and the finished drawing? It always starts with sketches on paper. Those rough ideas are usually done in quite a short time. I sometimes look at references in an image bank I created years ago to widen my ideas. This file is full of pictures I take through my different trips. From these sketches, I then choose the best ones to refine them in a new composition. This gives me the direction to follow on a bigger scale for the final piece, on which I add lots of details, life and volume. It’s generally a long process which requires long hours, a few weeks sometimes, depending on the size and the technique I choose. Another love in your life is New Balance. 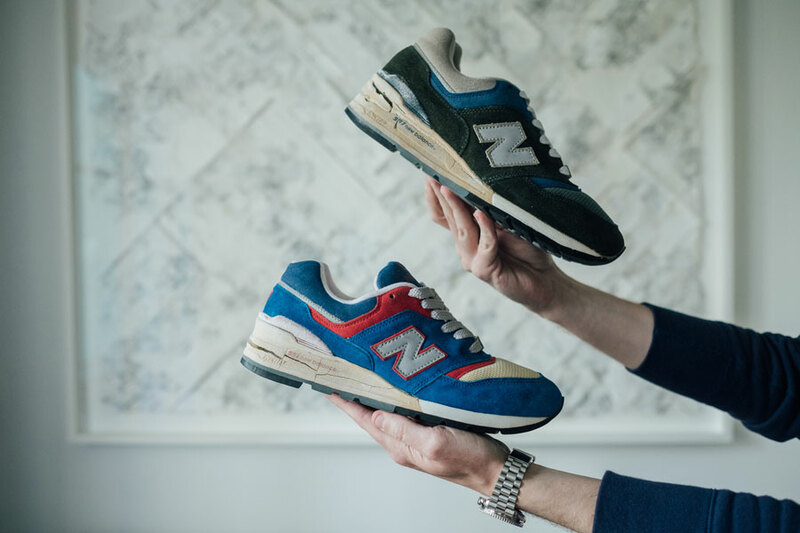 How did you get into collecting New Balance, how did that start and what is the fascination to you? I’ve been quite passionate about sneakers for a very long time. 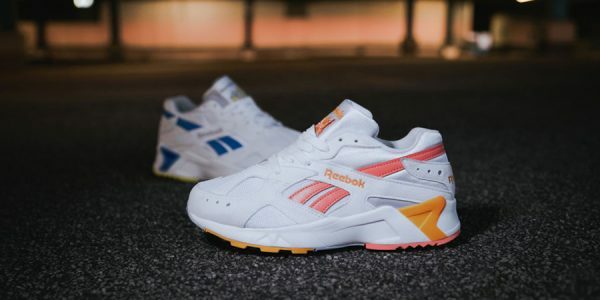 It all started in the 90s, first with basketball shoes, then running shoes with their sharp shape and sleek design. 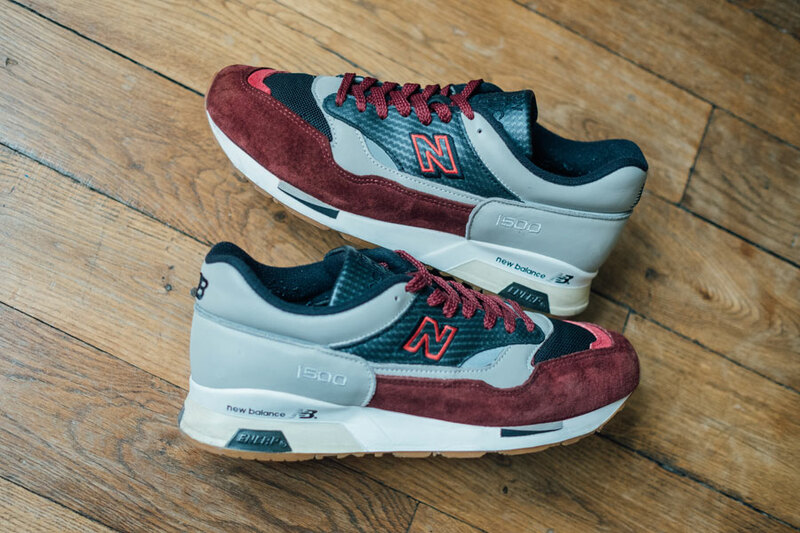 This is one of New Balance’s specificities, which represents, to my opinion, an image of relaxed, well-executed and timeless shoes. I love the fact that they use grey as their signature colorway on every model they release. Thereby you cannot be distracted, and stay focused on what the product has to offer: well-made, comfortable and functional sneakers. There is no gimmick, no endorsement by an athlete, just pure function. What about media that influenced you in these early days? 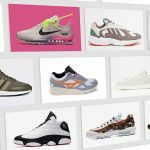 In 2005 I discovered Crooked Tongues’ website, which was one of the main sources of information about sneakers in Europe. The forum board was a goldmine to get precise details about old models, special colorways, rarities, samples etc. The level of knowledge that was shared by all the members was outstanding. 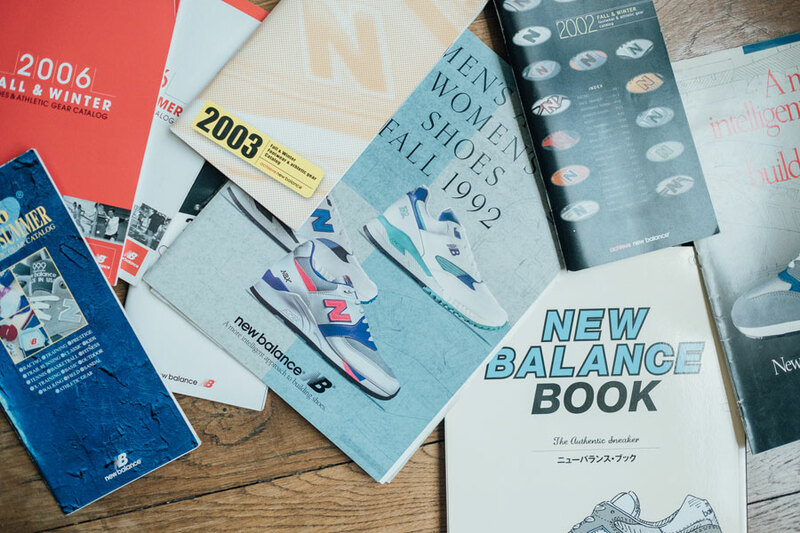 I remember the New Balance section was filled with pictures of crazy designs, obscure models and oddities that sealed my interest for the brand. 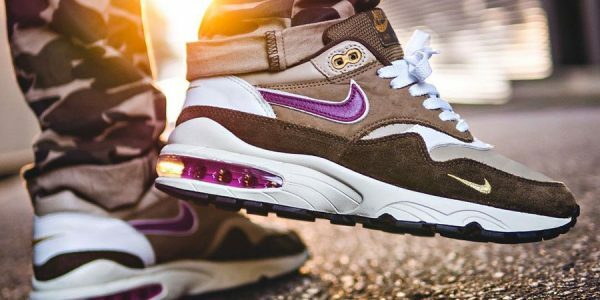 Later in the same year, a team of true passionates created the French forum Sneakers.fr. 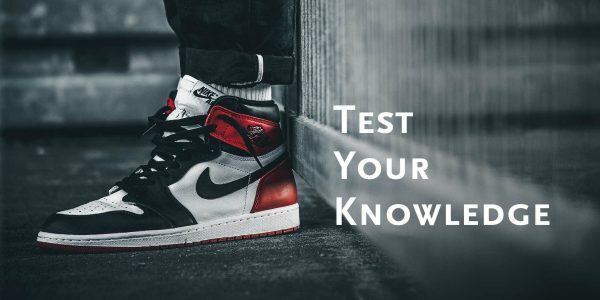 This board allowed French people to talk about sneakers, culture in general and even to organize meetings to share their knowledge off line. 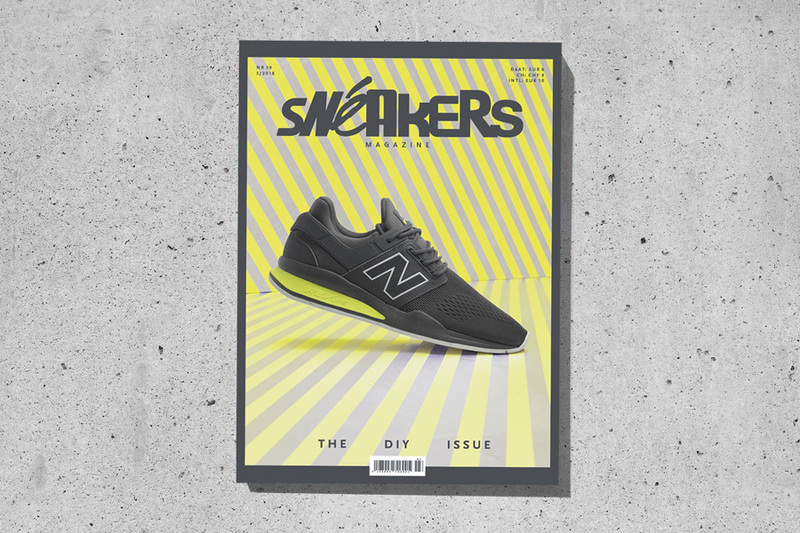 That time marks the beginning of great collaborations between New Balance and famous labels or stores like Colette, Kitsune, Solebox, Offspring, Microzine, etc. 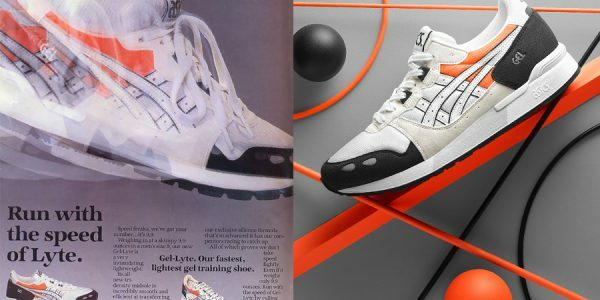 These partnerships often lead to the birth of very limited, iconic models. 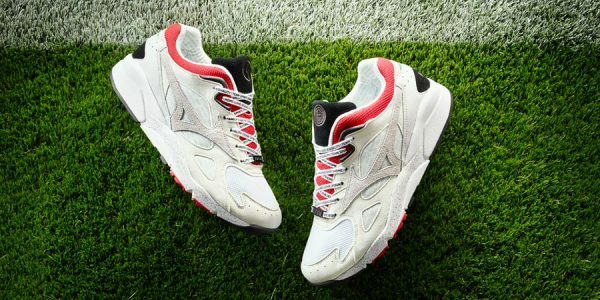 My interest in NB has grown, especially with the quality delivered and by the fact their shoes were manufactured in the UK and in the USA by workers that still stitched them by hand. The way the shoes are built is somehow something I can relate with my work: putting a lot of attention to details without worrying about the long process of creation and with a constant goal of doing the work the best way possible. 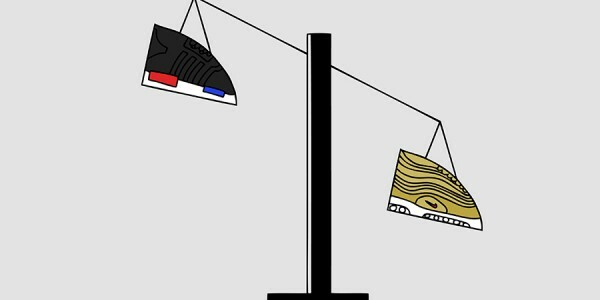 New Balance is a much smaller company and also independent, unlike Nike or adidas. Is that part of the fascination? What else sets it apart from other companies in your perception? One of the main reasons I’m still passionate about NB lies in the fact that there are still some models or variations I’m discovering today. I’m always searching for old catalogues in the hope to get more information, as there is not a proper archive available. You need to find stuff by yourself or with the help of the community. And I guess that’s part of the beauty of it. You never know what you will find tomorrow. 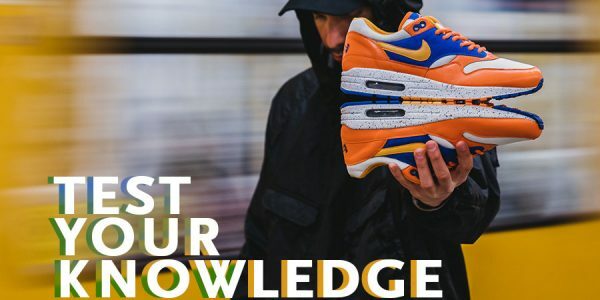 As New Balance has licenses in Japan and UK, they also have some unique editions in those countries; and sometimes for vintage models, it’s really hard to find a record of those, other than finding them on websites like eBay, Yahoo! Auctions Japan or Rakuten. The hunt is endless. 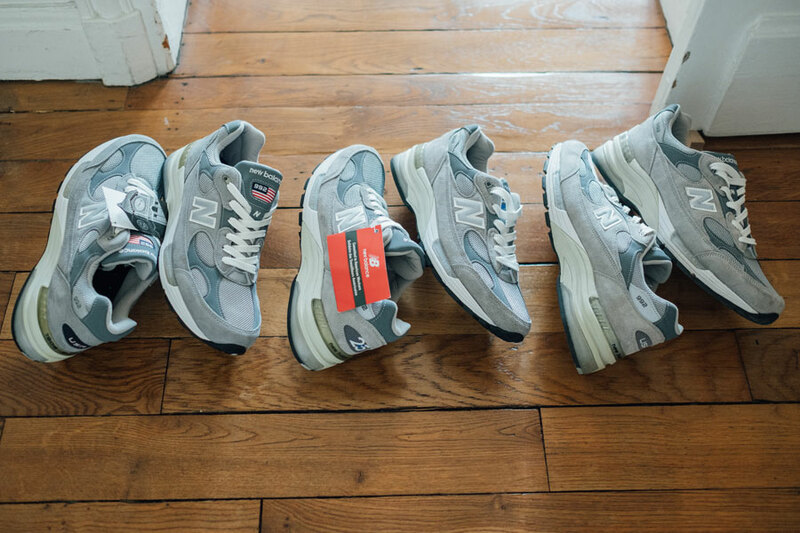 What are your five favorite New Balance? Tough to reduce to only five. I guess the choice could be different every day, depending on the mood, weather, outfit etc. Anyway, in no particular order, here is my choice for today: M997 from 1991, M1500 from 1989, M992GLX, M576STI and M1700GR. You mentioned the 997 as your favorite model. 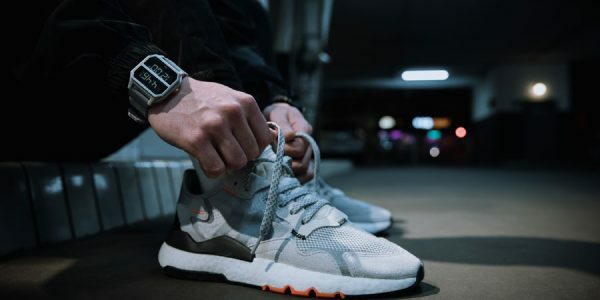 What are your thoughts on some of the new models they’ve come up with, like the 247 or even the tech running products? Is that interesting to you, or are you strictly into archive stuff? I’m thrilled by the future, the new X90 silhouette particularly. This new model and its variations coming in the following months represent a perfect balance between the past and the future of the brand. The upper pays tribute to a lot of great models, like the 991, whilst the midsole is a brand-new creation. 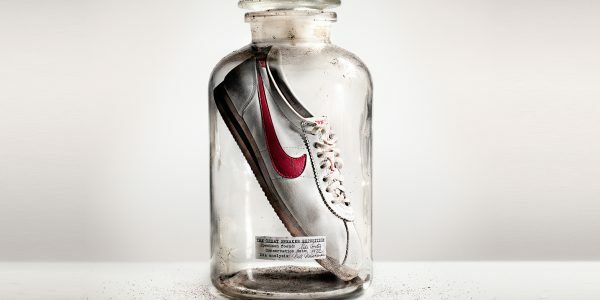 I love this kind of creating process, paying tribute to the past with a look towards the future at the same time. 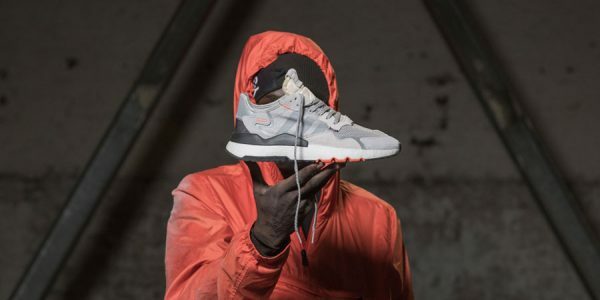 The 99x series is still evolving, so I guess the future will bring another iteration, like a 990v5 or maybe a hypothetical 994. Who knows, I can’t wait to see what they’re cooking in the NB design department. 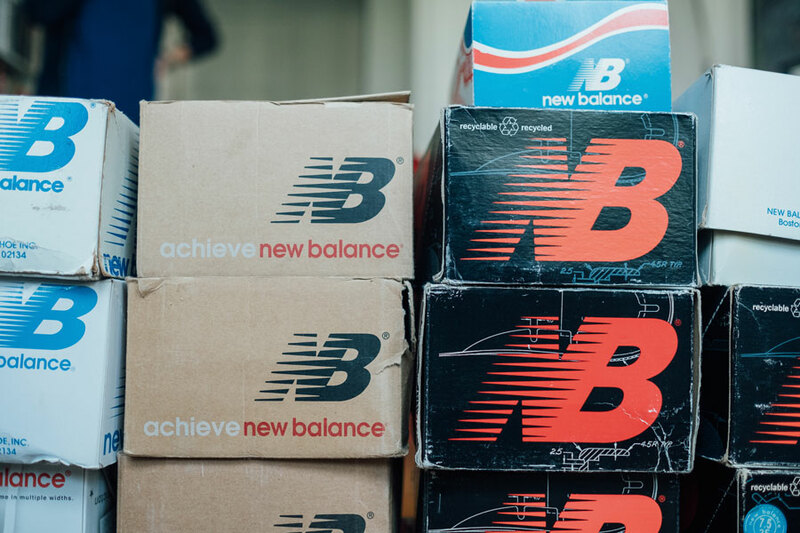 What era of archive New Balance stuff is most interesting to you, and why? I guess I’m more and more into older models from the early 80s, the roots of New Balance. I had a chance to get my hands on a pristine pair of M990 from 1982, and this is maybe one of the best pairs in my collection, a 35-plus years old timeless classic that sets a high standard of craftsmanship and performance until today. 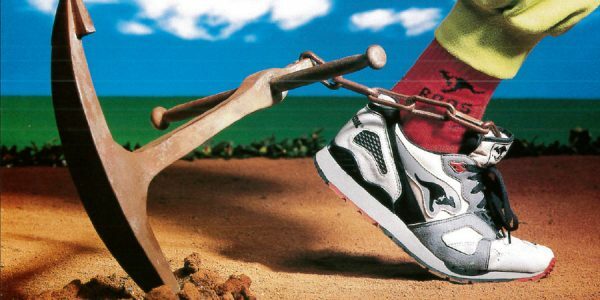 I love the Steven Smith era too, between 1986 and 1988, as he designed a lot of great and unique models for New Balance, like the 1500 and the 997 to say the least. 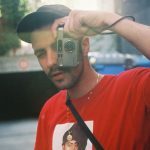 What are your thoughts on general releases vs collaborations? To be honest I’ve been less interested in collabs lately; so much stuff is releasing each week, it’s just an overdose of products sometimes… I prefer to focus on basic GR colorways and vintage models these days. Grey, navy or burgundy are perfect for me. 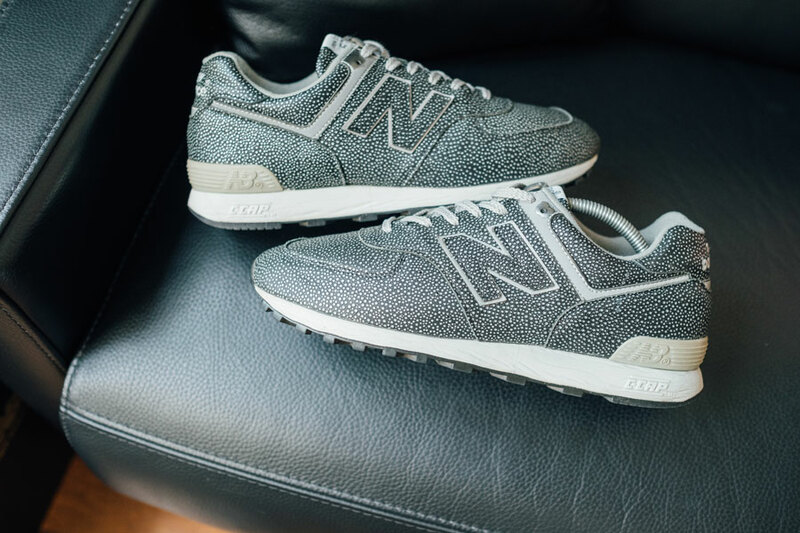 You even have a New Balance cooperation where you drew the 574. How did that come about? Did they know you as a collector already? For the release of the 574, New Balance gathered selected people in 20 cities around the world to celebrate the rebirth of this model. I was honored to be part of this special day, called “NB Grey Day”. I chose to pay a tribute to Boston, the city where the brand and the 574 were born. 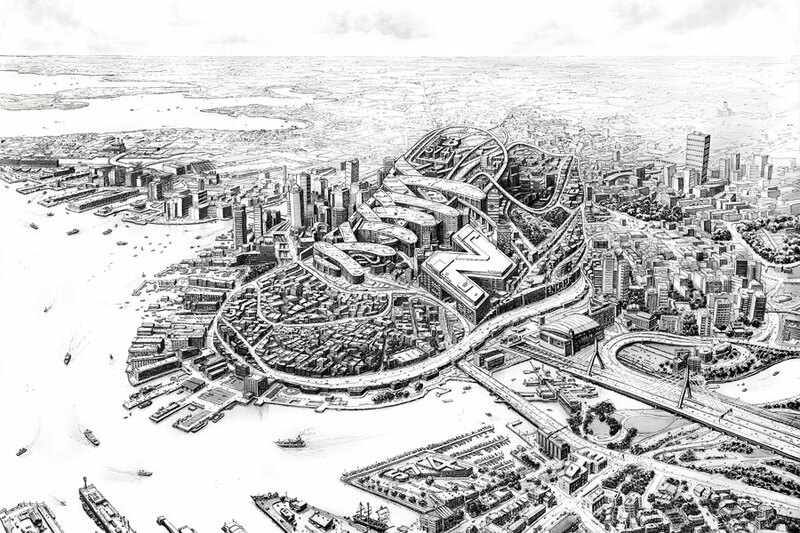 I represented the design of the model through the famous Boston cityscape as if the shoe embodied the city. 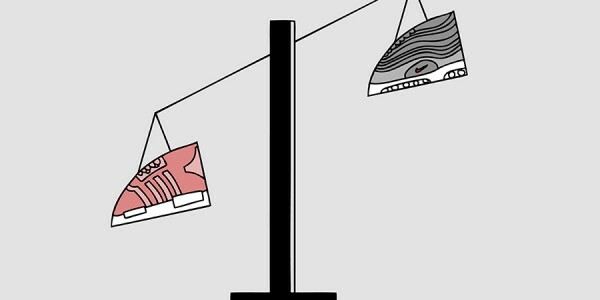 And of course the color of the piece had to reflect the DNA of New Balance with their famous timeless grey; that’s why I used diluted ink to add the different shades of grey through the drawing. 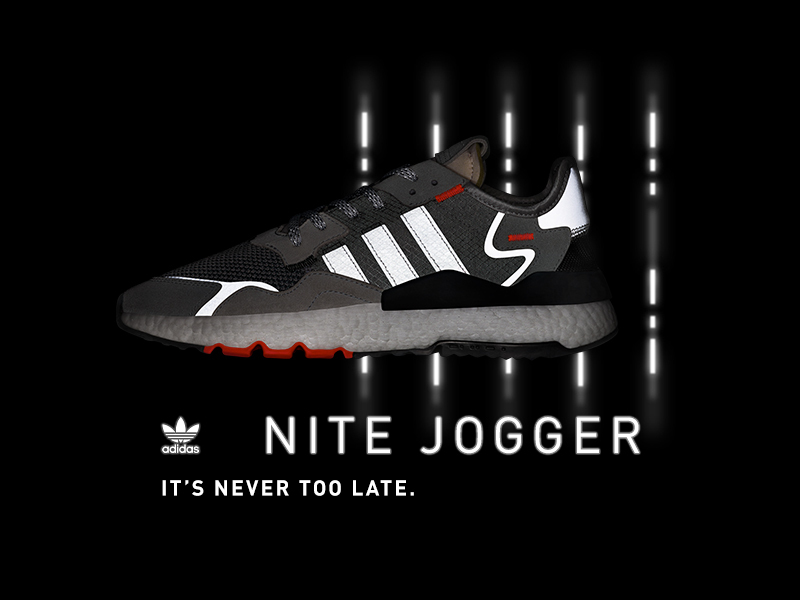 New Balance approached me through my double identity: as an artist first, to create this tribute during a live performance in front of the audience, and as a New Balance enthusiast too. Are there still pieces missing in your collection? Sure! But I’m not hunting models like I used to. However, I won’t say no to a 1300 made in Korea or a 735 in my size. But actually, all I want is a comeback of the 1500 made in USA with the same quality standard as the 1300JP. As 2019 will mark the 30-year anniversary of this model, I hope NB will celebrate this great model with a premium edition. And what are the next big things in your artistic life? New plans, exhibitions or projects we need to know about? I have several projects in the making, but my main goal for 2018 is my exhibition in December at the Carrousel du Louvre for the Salon des Beaux Arts. 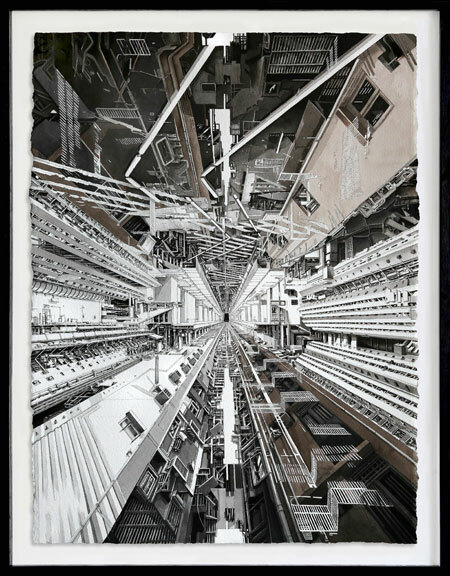 My last body of work is the result of compiling urban perspectives, skyscrapers, building façades. Things that represent crossing points in the cities – bridges, railroads, highways, subway corridors, train platforms – are a source of inspiration, and I see them as vectors of rhythm. These elements are my raw material that I cut into like a collage, mixing all the pieces to find an order from the chaos. The pieces can remind us of parts of New York, Shanghai, Tokyo or Paris. We feel we know these places, they’re familiar locations to all of us, but at the same time we can’t recognize one in particular. My aim is to create universal places, recreating a feeling, an emotion, emanating from the layers of the city, this huge organism constantly in mutation. I have new pieces in progress and I’m thinking of a new concept mixing VR technology and drawing – stay tuned! Let’s keep our eyes wide open – creation is everywhere! A limitededition print of my 574/Boston drawing will be available through my website www.decktwo.com. And for the Paris fashion week, I’m exhibiting a selection of my New Balance collection in a private showroom, with NB France. Get more information about the venue in the coming days through my Instagram, @deck_two.